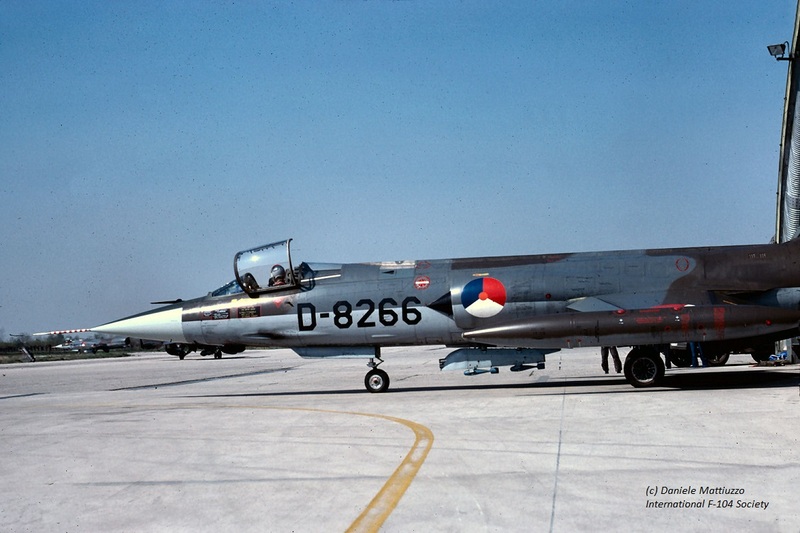 This month German Navy MFG2, 1st Staffel, from Eggebek, flying the RF-104G exchanged with the Italian Air Force 132 Gruppo, based at Villafranca, flying the F-104G. It was a two way exchange. 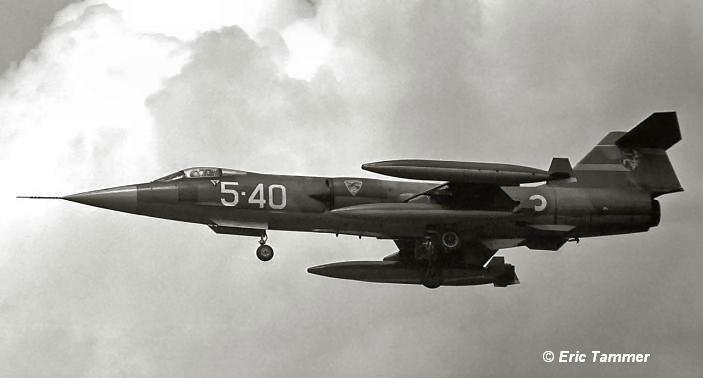 Four German RF-104Gs flew to Villafranca and four F-104Gs (Iikely with Orpheus recce pods) flew to Eggebek. This month the Dutch Air Force 311 Squadron from Volkel AB, flying the F-104G, exchanged with the Italian Air Force 155 Gruppo, based at Istrana, flying the F-104S. It was a 2 way exchange where the Italians flew to Holland with four Starfighters. being MM6741/51-34, MM6744/51-35, MM6795/51-50 and MM6919/51-51. 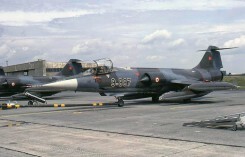 The two Starfighters MM6741/51-34 and MM6798/51-52 paid a pre-visit to Volkel AFB on March 2nd, 1981. The Dutch Starfigthers which flew to Istrana AB were D-8104, D-8244, D-8256 and D-8266. During the exchange all Italian Starfighters received 311 squadron badges on their noses which gave them a strange appearance. 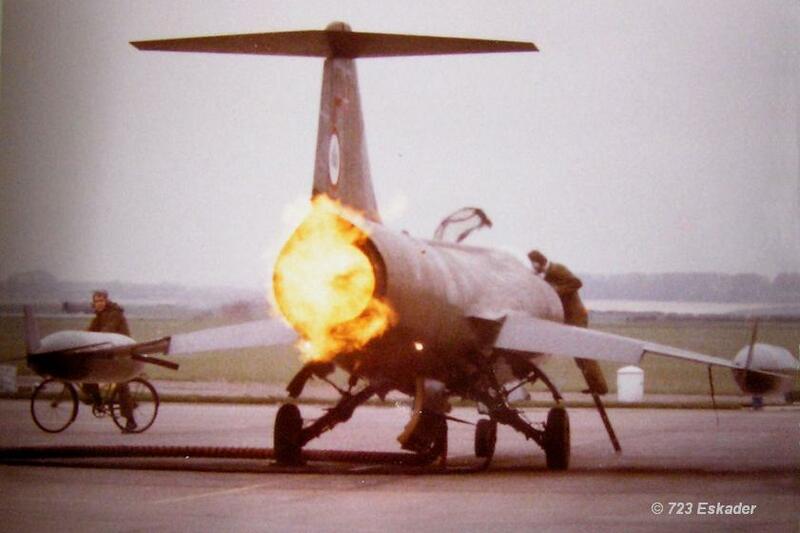 On the other hand, the Dutch Starfighters were zapped at Istrana with lots of paintbrushed panther claws.....The Dutch aircraft also participated in shooting exercises near Istrana, such as on April 13th. 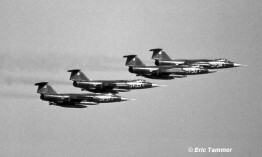 Photos beneath show All four F-104S Starfighters in formation over Volkel Air Base flying home again on April 15th (Eric Tammer), Another formation photo during the leave to Italy (Carlos Geurts), F-104S MM6744 code 51-35 while landing at Volkel on April 14th. 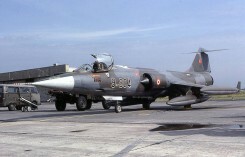 with a big 311 squadron badge beneath the cockpit. 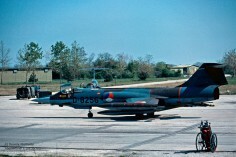 (Carlos Geurts), Italian MM6795 code 51-50 landing together with Dutch Air Force D-8114 at Volkel. 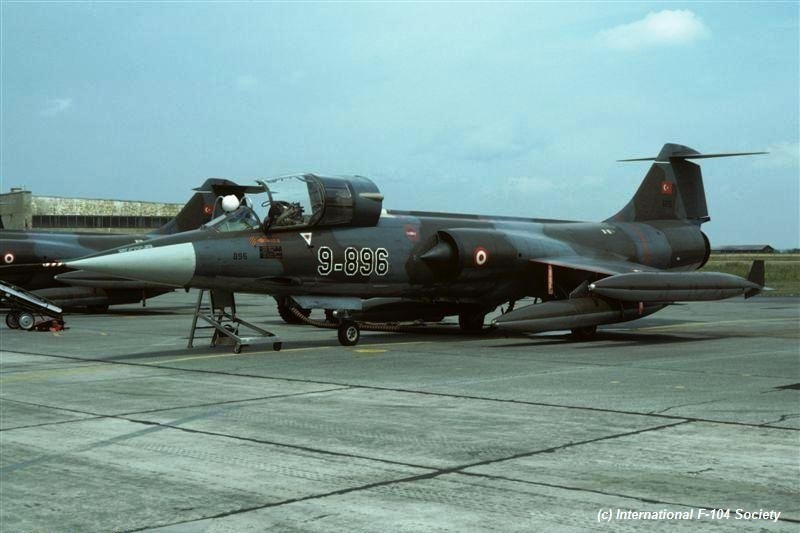 (Hans van Zeeland) and finally a photo showing D-8104 showing the 155 Gruppo zap (Jorgen Knizia). 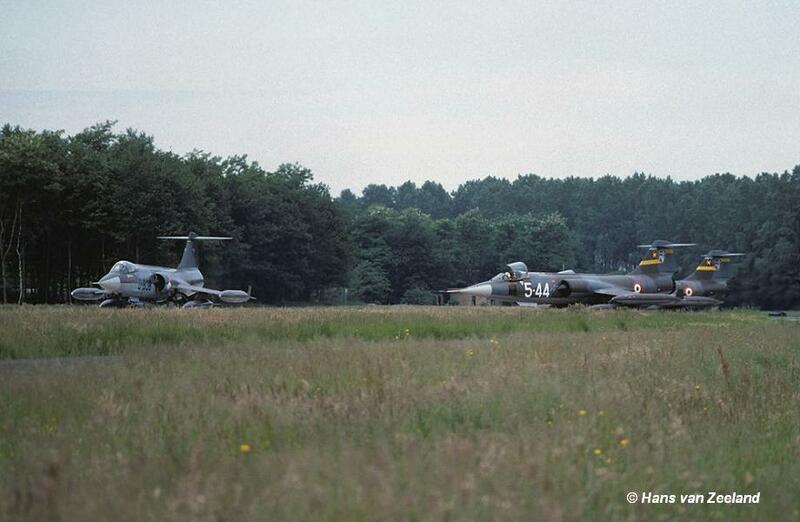 Finally two color photos taken at Istrana Air Base by Daniele Mattiuzzo showing the Dutch D-8256 and D-8266 taxying out of their used shelters for another bombing mission on the nearby range. 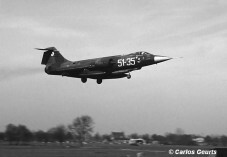 This period a squadron exchange took place between Italian Air Force 23 Gruppo from Rimini, flying the F-104S, with the Dutch Air Force 312 Squadron at Volkel AB flying the F-104G. 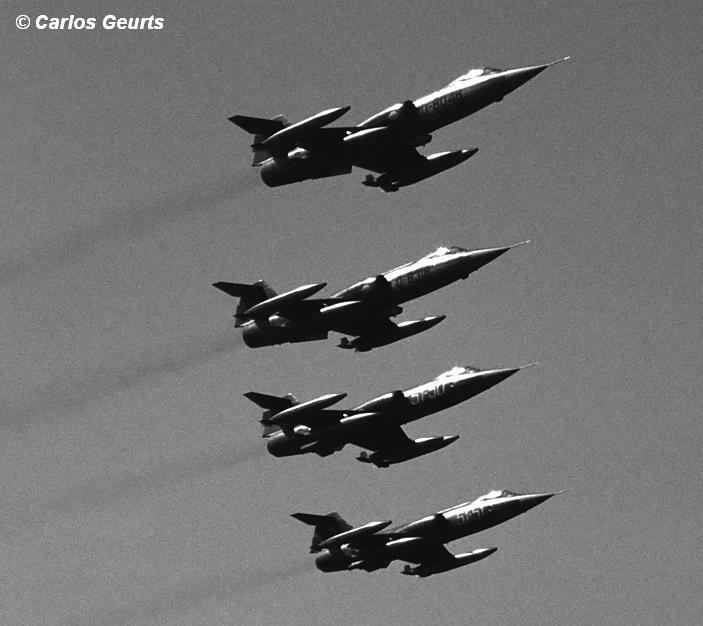 Four Italian Starfighters came to Volkel. 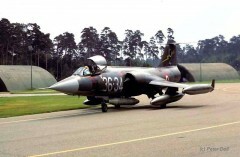 Participating aircraft at Volkel were MM6805/5-40, MM6708/5-42, MM6869/5-43 and MM6731/5-44. 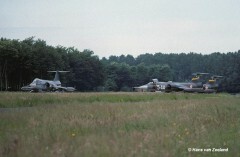 The two aircraft MM6826/5-31 and MM6767/5-45 paid a pre-visit to Volkel on April 28th, 1981. 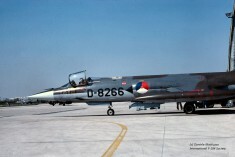 The Dutch Starfighters which went to Rimini were D-6695, D-6699, D-8268, D-8281, D-8312 and D-8337. Photos beneath show MM6805 with code 5-40 arriving at Volkel on May 26th. 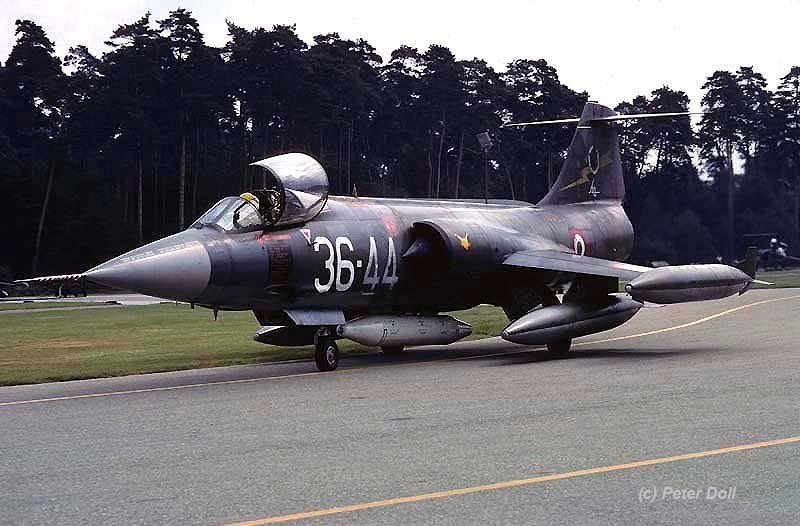 (Photo Eric Tammer) and two photos taken by Hans van Zeeland showing MM6869 with serial 5-43 wearing a 312 squadron badge on its tail and MM6731 with code 5-44 (and another S) while waiting for Dutch Air Force D-8138 taking off.. Also a photo showing D-8337 at Rimini. 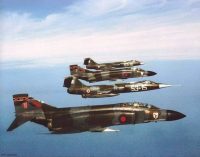 This period there was a squadron exchange between the Belgium Air Force 23 Smaldeel (10 Wing), operating the F-104G from Kleine Brogel and Royal Air Force 43 Squadron flying the Phantom FG.1 from Leuchars, Scotland. It was a two-way exchange. 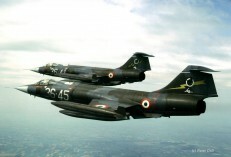 This period German Navy MFG1 from Schleswig-Jagel, flying the F-104G exchanged with the French Navy squadron 11F, based at Landivisau flying the Super Etendard. It was a two way shifted exchange where the French flew to Germany with three Super Etendards already in April and the Starfighter flew to France in June. This month there was a squadron exchange between the Dutch Air Force 306 Squadron from Volkel AB flying the RF-104G, with USAFE squadron 1 TRS/10 TRW, based at Alconbury AFB. 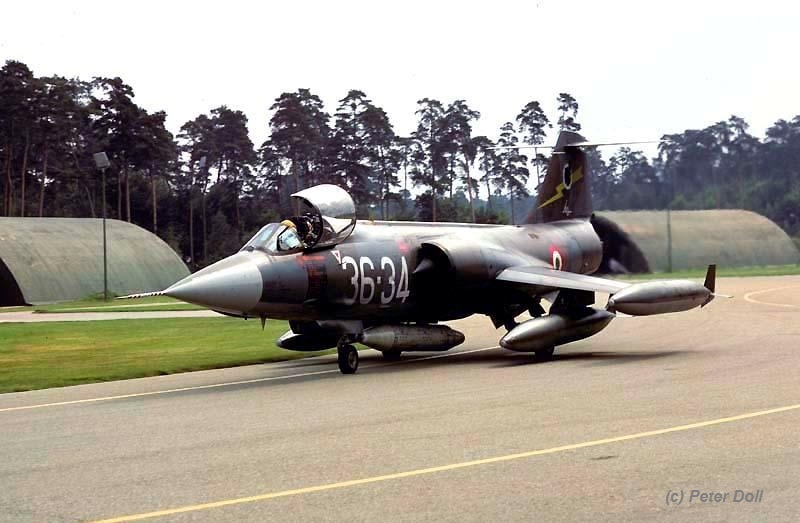 It was a 2 way exchange In total 6 different RF-4C aircraft were seen at Volkel these days and the Starfighters which flew to the UK were: D-8013, D-8065, D-8066, D-8133 and TF-104G D-5803. 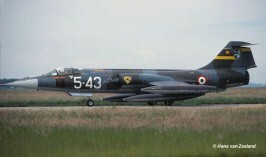 This month a squadron exchange took place between Italian Air Force 12 Gruppo from Gioia del Colle, flying the F-104S, with the German Air Force WS10 (1st Staffel) based at Jever AB, flying the F and TF-104G. It was a two-way exchange. Four Italian Starfighters came to Jever but they could not be identified. 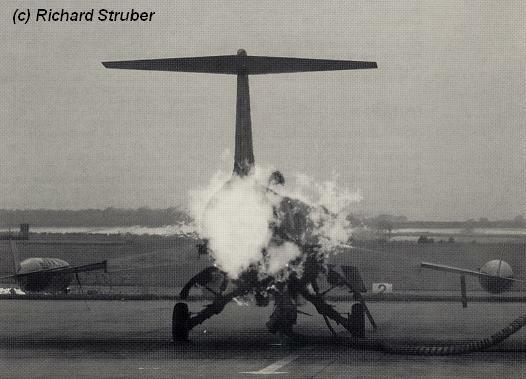 One of them run off the runway after an emergency landing (hydraulic failure) on 15 June 1981 damaging the aircraft. 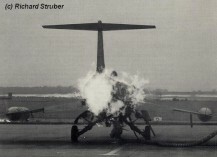 Also the serials of the German Starfighters to Gioia are unknown. 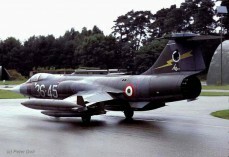 This year there was a squadron exchange between the Italian Air Force 102 Gruppo from Rimini flying the F-104S, with French Air Force squadron EC 2/3 based at Nancy and flying the Mirage IIIE. It was a 1 way exchange. Only the F-104s flew to France on May 23rd and one of them was F-104S MM6843 code 5-13. See photo provided by Pierpaolo Maglio. This year there was a squadron exchange between 156 Gruppo from Gioia del Colle, Italy with the Canadian CF-104s of 421 Squadron based at Sollingen. It was a shifted exchange. 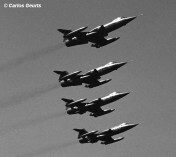 First the Italians came to Sollingen with 4 Starfighters and later on in October the Canadians flew to Italy. Seen at Sollingen were MM6759/36-34, MM6915/36-41, MM6785/36-44 and MM6921/36-45. 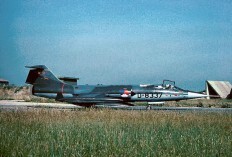 Photos beneath show a the participating Italian Starfighters at or over Sollingen Air Base, by Peter Doll. 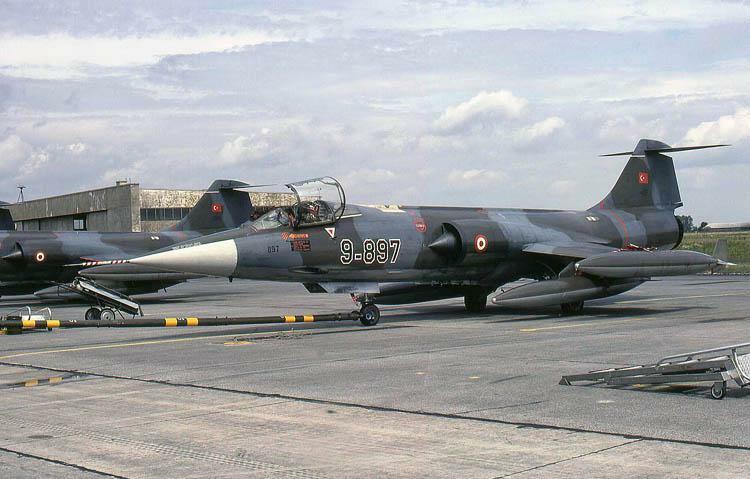 This month a squadron exchange took place between Turkish Air Force 192 Filo (within 9 AJU) based at Balikesir AB, flying the F-104S, with the German Air Force JBG32 based at Lechfeld AB. 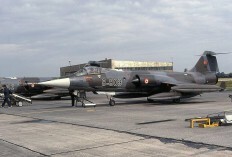 Five Turkish Starfighters came to Lechfeld being 6896/9-896, 6897/9-897, 6902/9-902, 6903/9-903 and 6904/9-904. 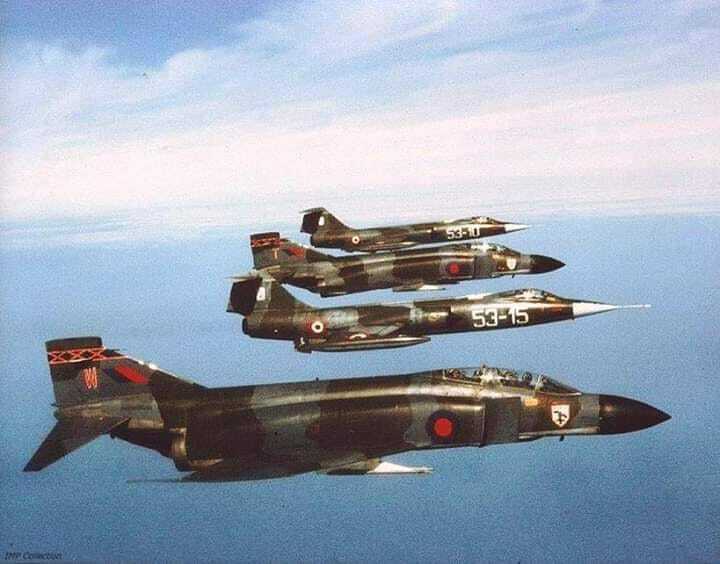 There was a photocall on the 21st of July 1981 and these 5 aircraft were heavily photographed that day by many aircraft enthousiasts, some examples beneath showing all the four participating aircraft on the flightline. 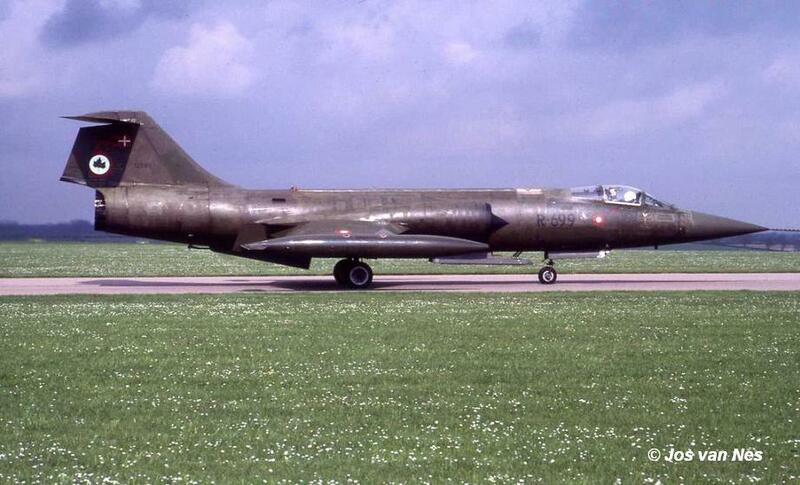 Some believe also F-104S 6900/9-900 has been at Lechfeld but we still need confirmation. Maybe it came later or has returned back earlier than the other five. This period there was a shifted squadron exchange between the Belgium Air Force 31 Smaldeel (10 Wing), operating the F-104G from Kleine Brogel and the Canadian 439 Squadron flying the CF-104 from Baden Solingen. First the Belgium Starfighters flew to Baden on August 24th with 4 aircraft and on September 25th the Canadians flew to Belgium. This month there was a squadron exchange between 21 Gruppo from Cameri, Italy with 29 Squadron at Coningsby flying the Phantom FGR.2. At least the Starfighters came to Coningsby, 4 in total. 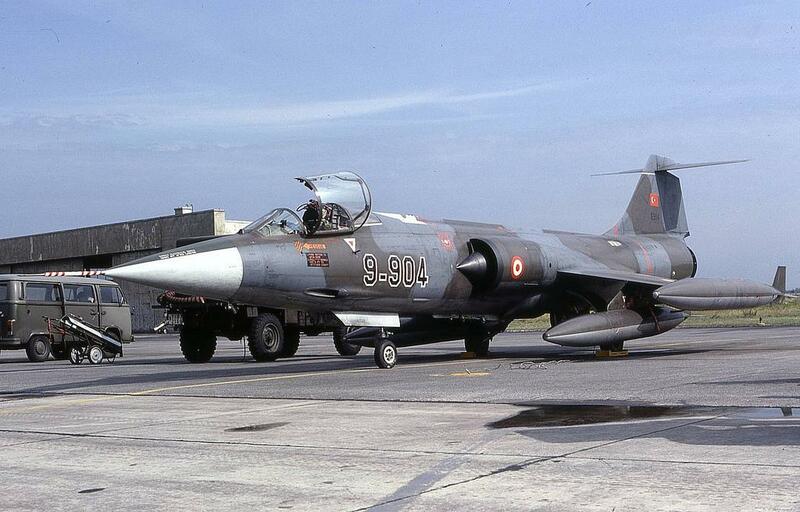 Pre-exchange toke place at Coningsby on 20 August 1981 by MM6850/53-10 and MM6935/53-15. 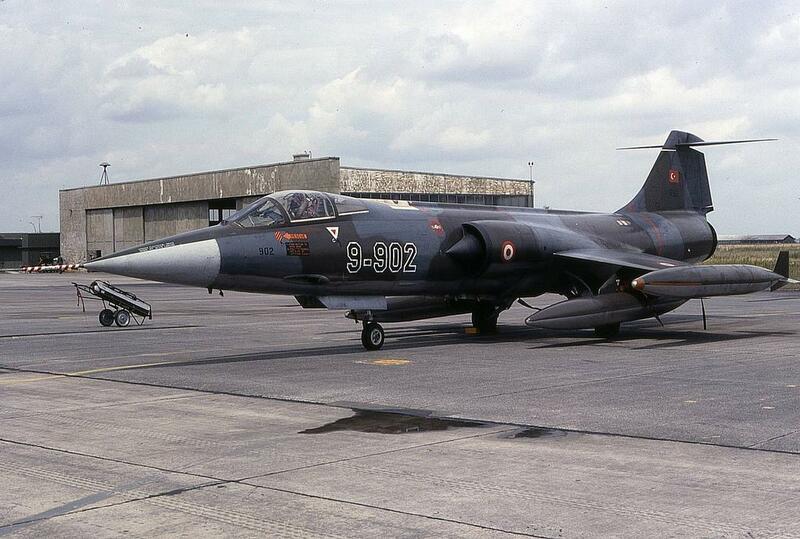 The participating aircraft during the exchange were MM6850/53-10, MM6717/53-12, MM6935/53-15 and MM6825/53-20. A C-130H Hercules transport aircraft with serial MM61994/46-08 came over as well. Photo beneath was found on internet via Angelo Crivelli. This month there was a 2 way squadron exchange between 22 Gruppo from Istrana, Italy with 20 Squadron at Bruggen flying the Jaguar GR.1. The Jaguars flew to Istrana on September 2nd. 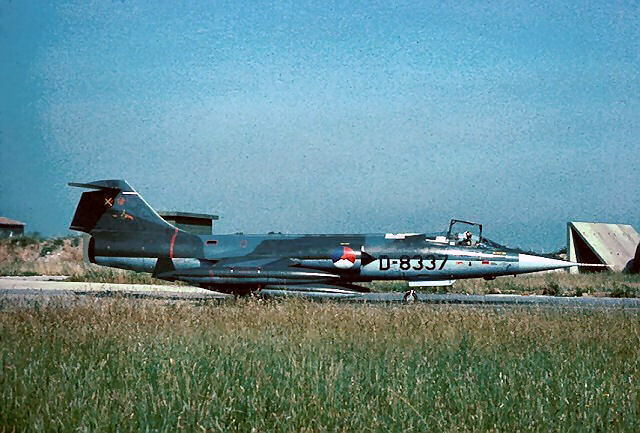 The next day the first two Starfighters landed at Bruggen (MM6764/51-04 and MM6775/51-06) and on 4 September the two others (MM6737/51-16 and an unidentified F-104S but likely MM6706/51-10). Transport was provided by C-130H Hercules MM61994/46-07 which arrived at Bruggen on 2 September and a possible RAF C-130 on September 11th. Pre-visit was on 13/14 July 1981 by MM6764/51-04 and MM6706/51-10. Information thanks to Hans-Jürgen Breuer. 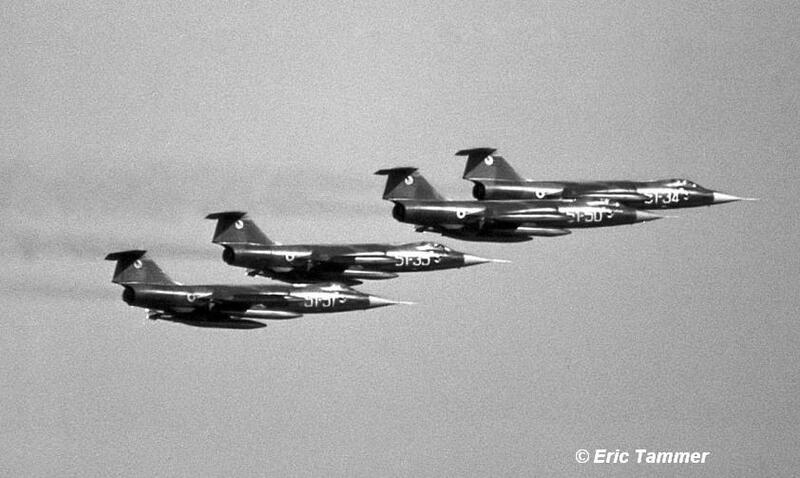 This year there was a squadron exchange between 156 Gruppo from Gioia, Italy with the Canadian CF-104s of 421 Squadron based at Sollingen. It was a shifted exchange. First the Italians came to Sollingen already in July while in October the Canadians flew to Italy. 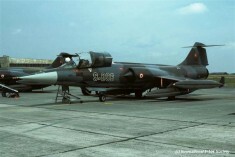 Sadly we do not have any serials of aircraft seen at Gioia.